Sponsors complain Julius Caesar was "intended to provoke." That's what theater's for! Gregg Henry as a Trump-like Caesar in the Public Theater’s free Shakespeare in the Park production of Julius Caesar. 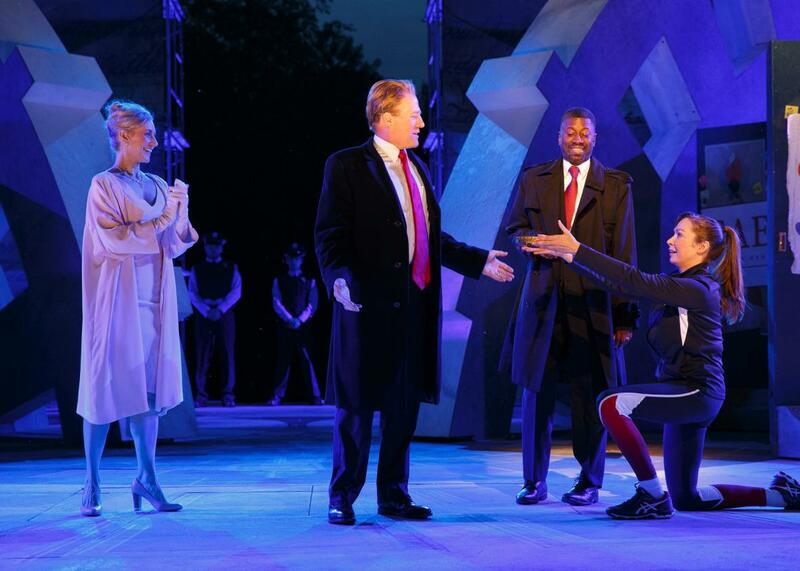 Shakespeare in the Park’s Trump-themed production of Julius Caesar suffered some stab wounds of its own Sunday night. Citing its “graphic staging” and “artistic and creative direction [that] crossed the line on the standards of good taste,” Delta Airlines pulled its support of the Public Theater, which produces the annual, free outdoor performances of the Bard. Bank of America, a major sponsor of the Public, followed suit, withdrawing its support of the show while retaining its funding of the theater in general. These announcements come on the heels of a few days of pot-stirring by right-wing outlets like Fox News and Breitbart, which objected to the play’s depiction of a Caesar with an extra-long tie, Slavic wife, and red baseball hat–clad supporters. Delta’s decision is misguided. It’s also disingenuous. During the Obama presidency, Minneapolis’ Guthrie Theater, along with the Acting Company, a well-regarded classics company that tours nationally, presented a Julius Caesar in which Caesar bore an intentional resemblance to Obama. * Not only was there no controversy, Delta sponsored the tour of the show and continued sponsoring TAC the next season. Delta was right then, and it is wrong now. Likening Shakespeare’s monarchs and politicians to real-life figures is a long-standing performance practice, seized by directors with sometimes illuminating, sometimes boneheaded results. For a director looking to add immediacy to her production of a classic, it’s hard to resist throwing contemporary references and iconography into the show. Over the past few decades, theaters in our nation’s capital have presented productions like a Gulf War Troilus and Cressida, a Rhinoceros about Newt Gingrich’s Republican Revolution, and Julius Caesars set explicitly in D.C. with regularity. Orson Welles famously staged an anti-fascist Julius Caesar in New York in 1937. Queen Elizabeth herself objected to certain resemblances she saw with the doomed king of Shakespeare’s Richard II. What makes the ginned-up outrage over the play stupider is that Julius Caesar is hardly an endorsement of political violence. By its conclusion, it is a horror show in which political violence is the Big Bad. The play takes place during the twilight of the Roman Republic, as a representative government is being pulled apart by the twin stars of aristocratic ambition and public gullibility. Shakespeare depicts Caesar’s murder as a great crime that unleashes the very forces the conspirators, led by the manipulative Caius Cassius and the tortured, reluctant Marcus Brutus, were trying to prevent. In the run-up to Caesar’s death, Shakespeare uses the conspirators to demonstrate how logic and reason can lead us to horrible conclusions. Cassius woos Brutus to the conspirators’ cause by having his partners forge anonymous notes from the public urging Brutus to intervene on Rome’s behalf. Brutus argues first that Caesar would make a good ruler because “to speak truth of Caesar/ I have not known when his affections swayed/ More than his reason” but immediately contradicts himself with an elaborate homily, saying “That lowliness is young ambition’s ladder/ Whereto the climber-upward turns his face/ But, when he once attains the upmost round/ He then unto the ladder turns his back.” Brutus is the play’s resident stoic logician—indeed, he’s close to being logic personified—yet he makes the wrong choice again and again and again. He trusts Cassius when he shouldn’t, goes in on the assassination of Caesar based on false evidence, and then, having done it, argues with his fellows to spare the life of Caesar’s lieutenant Mark Anthony and to try to persuade him to support them. Caesar’s assassination comes at the exact midpoint of the play, and, as a direct result of the conspirators’ legitimizing political violence, reason gives way to emotional manipulation and mob rule. Mark Anthony and Octavian (the future Caesar Augustus) draw up kill lists and begin murdering their enemies. Brutus’ wife’s elaborate suicide via swallowing hot coals destroys his stoicism, and he must fake his resolve in front of his underlings. The conspirators, now on the run for their lives, find their reason giving way to bickering to such an extent they don’t seem to recognize one another or themselves. After a stinging military defeat—itself the result of a bizarre mix-up on the battlefield—the conspirators kill themselves, and the Republic dies for good with them. Quite a ringing endorsement of political assassination! If anything, the raised hackles on the right merely demonstrate their love of thuggery and political violence. It’s far more offensive to be likened to Brutus (who in Eustis’ production is played by Corey Stoll) than to Caesar. * A willingness to kill your enemies is a far worse character trait than being power-hungry and beloved by the people. Even the ancient Greeks, who never showed violence on stage, still made the theater the place where the most controversial subjects of their time could be dramatized, debated, and discussed. It’s right there in our language. The theater is the place in which the obscene (which comes from the root ob skene or “offstage”) moves into view so that we can reckon with it, both individually and as a community. That is the most vital of theater’s purposes, the one that makes it an essential art form for a functioning democracy. Absent a willingness to provoke in a meaningful way, theater in our society will only be a bauble for the wealthy. Bank of America or Delta might prefer it that way, but no one who cares about art should stand for it. *Correction, June 12, 2017: This post originally misidentified the actor who portrays Brutus. He is played by Corey Stoll, not Elizabeth Marvel. It also misstated the name of the company that co-produced a 2012 production of Julius Caesar. It was the Acting Company, not the Actors Company Theatre.